Italian rabbi; flourished in the fifteenth and sixteenth centuries. He studied at Naples in the school of his father, Messer Leon, author of "Libnat ha-Sappir," and received at the age of eighteen his rabbinical diploma from German and French Talmudic authorities. Soon afterward he went to Padua, where he studied under Judah Minz, who granted him a new rabbinical diploma. He then betook himself to Turkey, and while sojourning at Salonica, where he prepared for publication his "'En ha-Ḳore," he was called to the rabbinate of Avlona at a salary of 70 florins a year. The community possessed three congregations of various nationalities, and Leon officiated successively in the three synagogues on every third Saturday. In the very first year of his rabbinate dissensions on account of a ritual question arose which caused the separation of the Portuguese and Catalonian Jews from the Castilians. Toward the end of his second year in Avlona a quarrel broke out among the Sephardim and the Portuguese. Leon, who sided with the Portuguese, had for antagonists Abraham Ḥarbon and Abraham de Collier. Excommunications were launched by both parties even on the Day of Atonement. 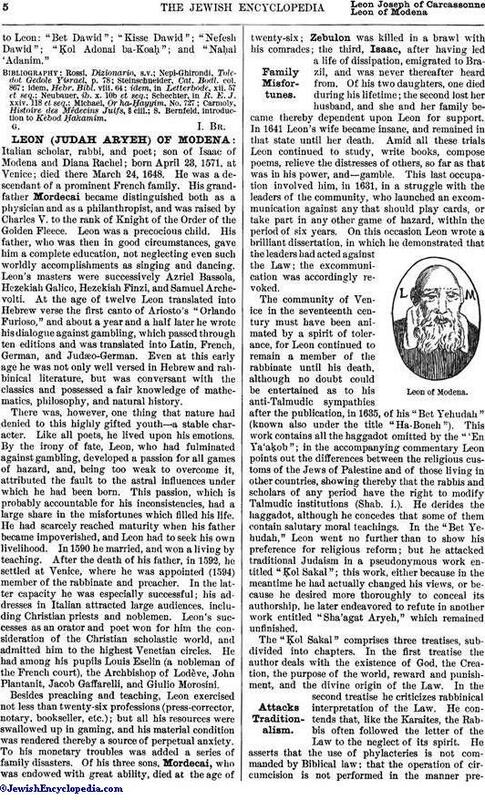 Leon was a prolific writer, and produced works in many branches of secular science, as well as on distinctively Jewish subjects. With the exception of two, all remained unpublished. Most of them are no longer extant, and are known only from quotations. Leon preferred to clothe his philosophy in the garb of the Cabala, in which he was an adept; but he was too much of a philosopher to become involved in the abysses of mysticism. In his cabalistic work "Magen Dawid," still extant in manuscript, he freely quotes the Greek and the Arabic philosophers. For him Plato was the greatest cabalist. This philosopher, Leon claimed, lived at the time of the prophet Jeremiah, who was his teacher. 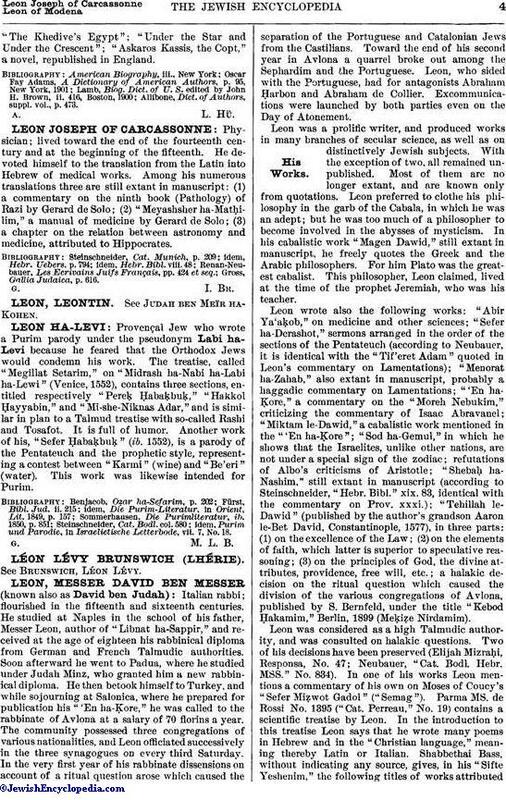 Leon wrote also the following works: "Abir Ya'aḳob," on medicine and other sciences; "Sefer ha-Derashot," sermons arranged in the order of the sections of the Pentateuch (according to Neubauer, it is identical with the "Tif'eret Adam" quoted in Leon's commentary on Lamentations); "Menorat ha-Zahab," also extant in manuscript, probably a haggadic commentary on Lamentations; "'En haḲore," a commentary on the "Moreh Nebukim," criticizing the commentary of Isaac Abravanel; "Miktam le-Dawid," a cabalistic work mentioned in the "'En ha-Ḳore"; "Sod ha-Gemul," in which he shows that the Israelites, unlike other nations, are not under a special sign of the zodiac; refutations of Albo's criticisms of Aristotle; "Shebaḥ ha-Nashim," still extant in manuscript (according to Steinschneider, "Hebr. Bibl." xix. 83, identical with the commentary on Prov. xxxi. ); "Tehillah le-Dawid" (published by the author's grandson Aaron le-Bet David, Constantinople, 1577), in three parts: (1) on the excellence of the Law; (2) on the elements of faith, which latter is superior to speculative reasoning; (3) on the principles of God, the divine attributes, providence, free will, etc. ; a halakic decision on the ritual question which caused the division of the various congregations of Avlona, published by S. Bernfeld, under the title "Kebod Ḥakamim," Berlin, 1899 (Meḳiẓe Nirdamim). Leon was considered as a high Talmudic authority, and was consulted on halakic questions. Two of his decisions have been preserved (Elijah Mizraḥi, Responsa, No. 47; Neubauer, "Cat. Bodl. Hebr. MSS." No. 834). In one of his works Leon mentions a commentary of his own on Moses of Coucy's "Sefer Miẓwot Gadol" ("Semag"). Parma MS. de Rossi No. 1395 ("Cat. Perreau," No. 19) contains a scientific treatise by Leon. In the introduction to this treatise Leon says that he wrote many poems in Hebrew and in the "Christian language," meaning thereby Latin or Italian. Shabbethai Bass, without indicating any source, gives, in his "Sifte Yeshenim," the following titles of works attributedto Leon: "Bet Dawid"; "Kisse Dawid"; "Nefesh Dawid"; "Ḳol Adonai ba-Koaḥ"; and "Naḥal 'Adanim." S. Bernfeld, introduction to Kebod Ḥakamim.